YOU CAN INCREASE YOUR INCOME, YOUR LIFESTYLE & YOUR WEALTH AT THE SAME TIME! What this book promises is not easy to do as creating wealth involves saving and self-discipline. While having the lifestyle you want often demands, for most people at least, spending more than they have on-hand. But it’s not impossible because I have managed to live like a millionaire since I was 28 and yet have still managed to accumulate wealth along the way. That’s not to say I could not be a whole lot richer or have not made tons of errors on the journey, but living life has always been more important to me than wealth. Which is why I take a three-month vacation every year, plus another four weeks on shorter trips in the remaining nine months. Yes, I know it sounds ridiculous and undoable to most people but it’s not and it’s actually quite fun! I am going to share personal growth strategies, career strategies, business strategies, income strategies, personal development and lifestyle strategies so you can accumulate real wealth and live like a rock star while you do it! 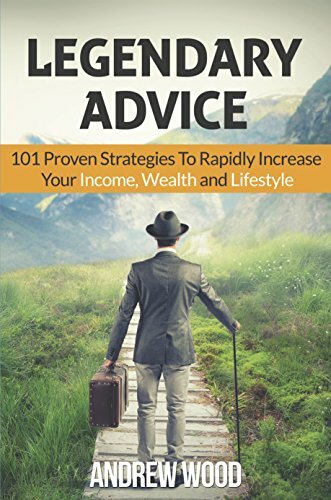 Start reading “Legendary Advice: 101 Proven Strategies to Rapidly Increase Your Income, Wealth and Lifestyle” on your Kindle in under a minute.